Bill Lederer and Ted Yang in the Stamford office of MediaCrossing. "What we bring to the table is a level of technical and quantitative rigor that doesn't exist." Do you ever wonder how the banner ad that pops up on your favorite website gets there, and who chooses what you’ll see? At the moment, the buying and selling of digital ads is largely controlled by big legacy agencies. But there’s a tiny upstart company in Stamford that wants to disrupt the growing market. Ted Yang said his company's new office has a feature that matches its tagline: Bridging the Market. "Right now," he said, "we’re walking through an actual bridge; a literal, physical way of expressing what we are as a company, which is really cool." Yang is Chief Technology Officer and the co-founder of MediaCrossing, a company that started from scratch barely two years ago, and moved into a space in Stamford's Landmark Square in 2013. 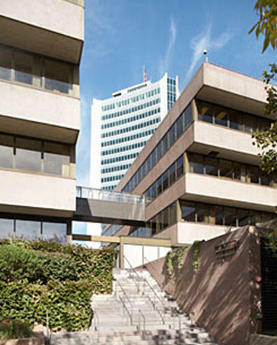 MediaCrossing's building includes a bridge, which has metaphorical meaning for the Stamford company. Yang said, "My co-founder and I, Bill Lederer, came up with the idea in the Stamford Innovation Center, which is about three minutes from where we’re sitting. We came up with the idea as a merging of Wall Street and Madison Avenue." MediaCrossing acts as a link, connecting buyers and sellers of ad space on the Internet -- banner ads, video, social media, mobile ads -- all kinds of ways of getting products and services in front of your eyes when you're online. That's the Madison Avenue bit, and of course, it's not a new business. "But what we bring to the table is a level of technical and quantitative rigor that doesn’t exist," added Yang. That's where the Wall Street part of the equation comes in. Yang is a former trader for Lehman Brothers, and he's worked in technology for two huge hedge fund. He's fully familiar with the tools financial institutions use to assess risk and drive down costs. Yang said the companies that currently dominate the online ad business aren't interested in those factors. "When you do media buys or sells," he said, "frankly, these guys take a piece of the action. If it’s 15 percent, you trade $1,000, that’s a check for $150.00 that goes to them. Therefore, they’re not under any incentive to truly innovate, and certainly not save you money and make things more efficient for you, because that hurts their revenue." MediaCrossing's model, instead, applies big data to calculate the right placement for an ad campaign, or the right buyer for an online ad space offered by a publisher, and it makes its money by assuming some of the risk that the right space will pay off. "We’ve seen hundreds of millions, or billions, of these transactions before," Yang said. "We can provide better insights into who are the right people that we can put onto that site, and therefore, yes, increase their revenue, but also make that more effective for the ultimate advertisers, so they’ll come back." "I'm interested where there are structural challenges in an industry." Co-founder Bill Lederer has also worked on Wall Street, and in advertising, including the world's biggest ad agency, WPP. Alongside that corporate experience, he's also a serial entrepreneur. This is the seventh company he's founded. "I’m interested in big problems," he said. "I’m interested, particularly, where there are structural challenges in an industry, where it’s difficult for the industry to solve its own problem." 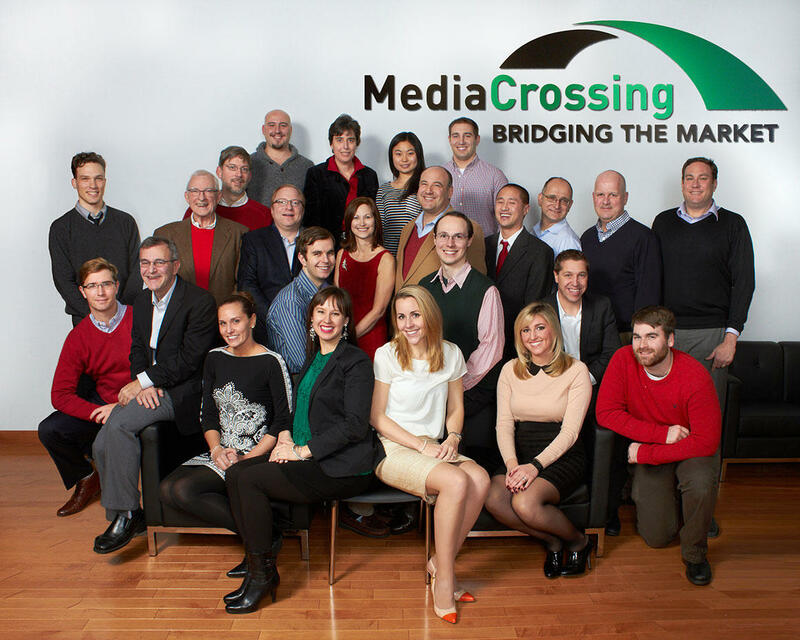 MediaCrossing started live trading ad space at the end of last year, and its client roster is growing. 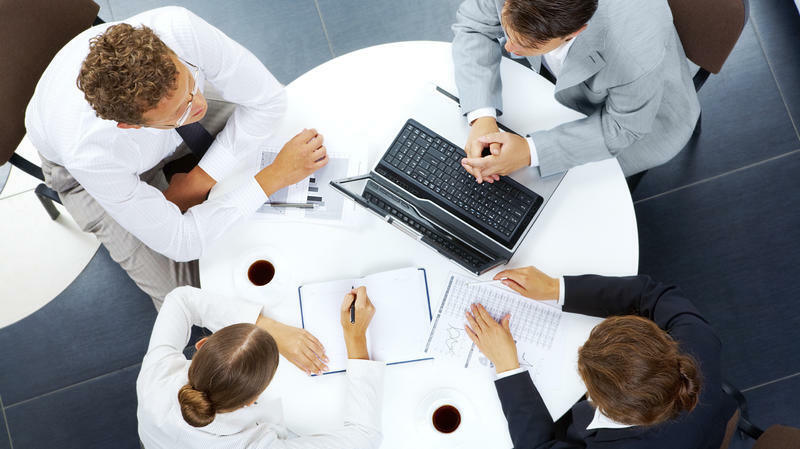 It has hired almost 30 employees, many of them with senior experience in the financial world. Lederer said the company probably won't turn a profit until 2016 or so, something that he said concentrates his focus. "I think Ted and I have proved we’re pretty good at our ability to write checks," he said. "Every day that we’re dependent on other people’s capital, there is the likelihood that we may lose value for ourselves, and our partners, in this business." They're backed by venture capital, and by money from Connecticut Innovations, the state's tech investment agency. Ted Yang said that for him, the move from the highly-structured world of hedge funds to the more exposed world of the startup is exhilarating. "You don’t know how good you are," he said, "unless you can do it without the net." The rewards are potentially worth it. Globally, advertising traded in this way could be worth $12 billion this year, and that's forecast to rise to $32 billion within three years. Connecticut Innovations has a new chief executive officer in charge of a potential merger and a much larger investment portfolio. Claire Leonardi spoke to WNPR’s Sujata Srinivasan on how she plans to shake up the organization. Claire Leonardi brings more than 30 years of experience in the financial services industry to her new job as CEO of Connecticut Innovations – or CI – a state-funded organization in Rocky Hill that invests in advanced technology ventures. It’s been a little over a year since Governor Dannel Malloy announced Startup Connecticut - an effort to support entrepreneurship in the state. The idea is to create an “innovation ecosystem” to grow the economy. The state is setting up four innovation hubs. Google. Twitter. Facebook. Back before they got big, companies like these were just startup ideas, born in dorm rooms and run out of garages. Then came the venture capitalists: rich, older men ready to fund the brilliant ideas of younger, creative men. But what if you are a woman with a startup idea? A new study says you might not do so well. It's been well-documented that businesses started by women receive very little venture capital money.